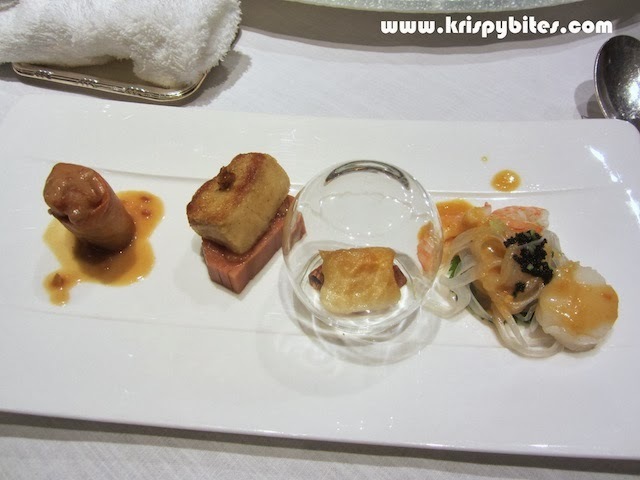 In celebration of Mousie's birthday, we went to a 2-star Michelin restaurant in Hong Kong for a fancy dinner. Ming Court, located in Langham Place Hotel in Mong Kok, features contemporary Chinese cuisine. As we walked into the restaurant, a flock of waiters greeted us, pulled out chairs for each person in the party, and even brought us a little table for putting our purses. 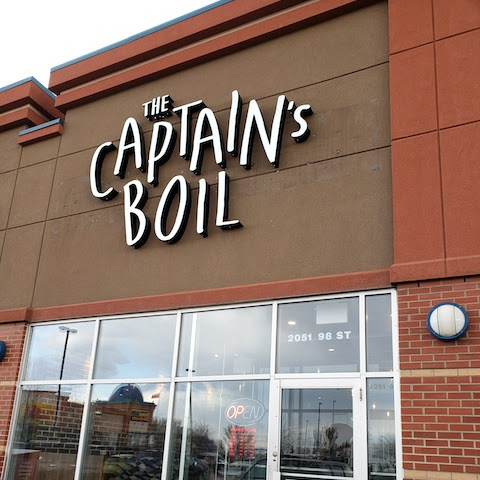 Service was good, but seemed a bit cold and impersonal, and even a little awkward at times. We decided to get the tasting menu ($598 HKD/person ~ $80 CAD/person) which included a few award-winning dishes as well as a glass of wine. 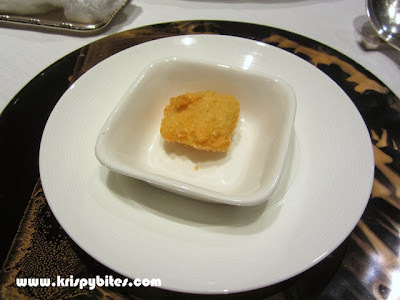 First up was a complimentary amuse-bouche of fried fish fillet. My first thought was that the presentation was really ugly and plain. 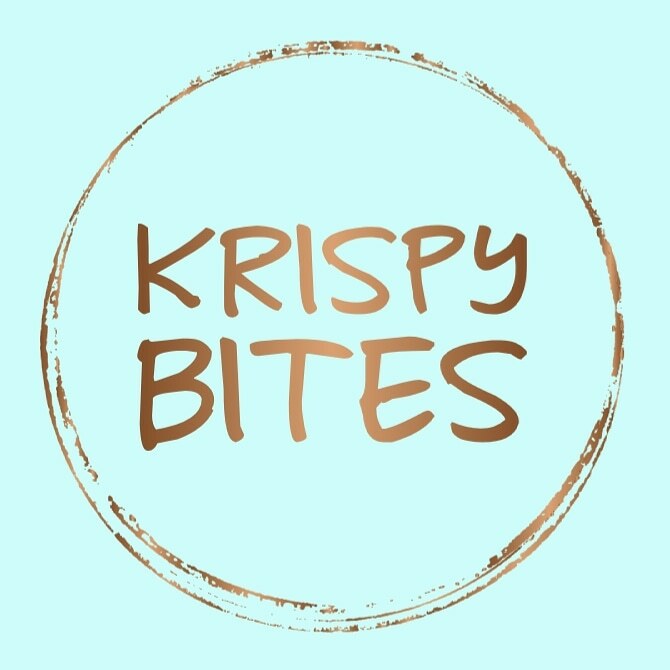 It looked like a piece of reheated frozen fish nugget from the supermarket and there wasn't even any sauce, so I was expecting the worst when I bit into it. To my pleasant surprise, the breading was thin and crisp, and the fish was unbelievably tender. The light seasoning added just enough saltiness to bring out the flavour of the flaky fish. The appetizer was the Dragon Quartet, an award-winning dish, and undeniably the highlight of the evening. I started with the scallop, prawn, sea urchin, and black caviar noodle salad on the right. All of the seafood was fresh and the tastes just blended together. Very refreshing! Next was the pu-er smoked fish served under a glass cup. We were instructed not to remove the cup until right before we were going to eat the fish because the aroma and flavour would escape otherwise. I took a whiff of the cup after I lifted it, and it had a beautifully earthy and delicate smell. The fish itself was rich and smoky, but I found the texture a bit too dense because the meat was cold. Then there was the thick slab of seared foie gras on a lotus root slice. I'm not a fan of lotus root, but I loved this one because the holes in the root were stuffed with sweet osmanthus flower. Last but not least was a spring roll lookalike, a bean curd sheet roll with a filling of assorted greens and peanut butter that tasted very rich for a vegetarian roll. All in all, I really liked the collaboration of Chinese and Western concepts for each item. The bird's nest soup with matsutake mushroom and bamboo pith was comparatively bland; it was still quite rich for a broth though. 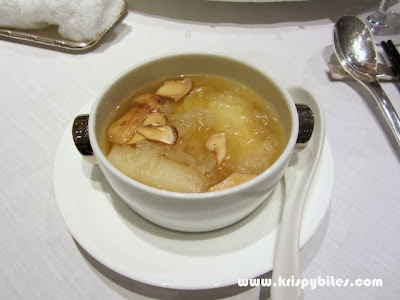 I didn't taste any bird's nest and mushrooms are not my thing, but I did enjoy the spongy bamboo pith. 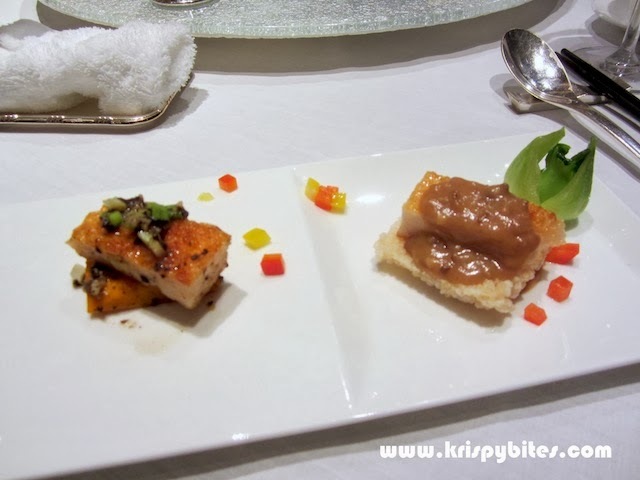 Then we had another award-winning dish — the minced shrimp and chicken thigh duet. The meats were minced together and shaped into flat cakes, resulting in a bouncy and firm texture. These shrimp and chicken cakes were made into two flavours, one with black truffle on a slice of buttery pumpkin (left), and the other with chicken liver pâté atop a crunchy rice crisp (right). Both flavours were good, but I failed to see them as anything more than a high-end version of fish cake. 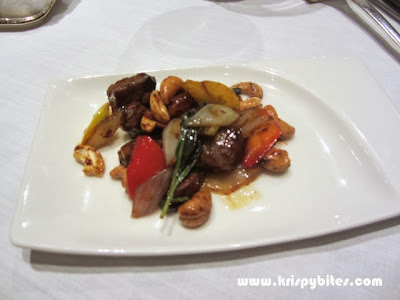 The third and final award-winning dish of the meal was the stir-fried Wagyu beef with Thai basil and cashew nuts. This was supposed to be really good because it won not just a gold award, but a gold award with distinction! Honestly the seasoning wasn't that spectacular, and there was absolutely no innovation because this was just a regular stir-fry. What really made this dish was the quality of the beef, that melt-in-your-mouth tenderness of lean and juicy meat. But although two of us had really good meat, the other two at the table ended up with a bad cut that was tough and chewy with tendons, so it's going to be a hit or miss depending on your luck. 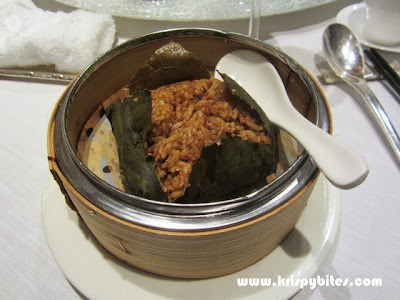 The most boring dish award goes to the fried rice with roast duck meat. Sure, it was wrapped in a lotus leaf and served in a bamboo steamer to make it look fancy, but it was still just fried rice. And the lack of ingredients made for a very flat, one-dimensional flavour. Even though I was really full at this point, I still managed to enjoy the dessert. 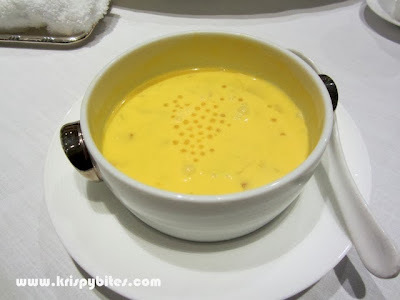 It was a creamy chilled sweet soup of mango, pomelo, coconut, and sago cream — the Chinese version of a smoothie. So was it worth $80 CAD/person for this meal? I'm on the fence with this one, but I can say I definitely don't regret coming here. However, the dishes after the Dragon Quartet were a bit underwhelming, so I wouldn't do the tasting menu a second time. 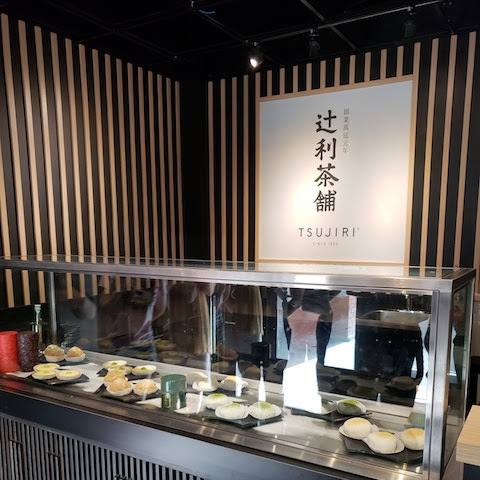 And given the Michelin 2-star rating, I would have expected both the food and service to be a lot better. The overall dining experience, though decent, left something to be desired.